Mappemonde a l'usage de l'Instr.on par Guillaume Delisle et Philippe Buache Premiers Geographes et de l'Academie des Sciences. Revue e Augmentee des Nles. Decouvertes par Dezauche en 1808. 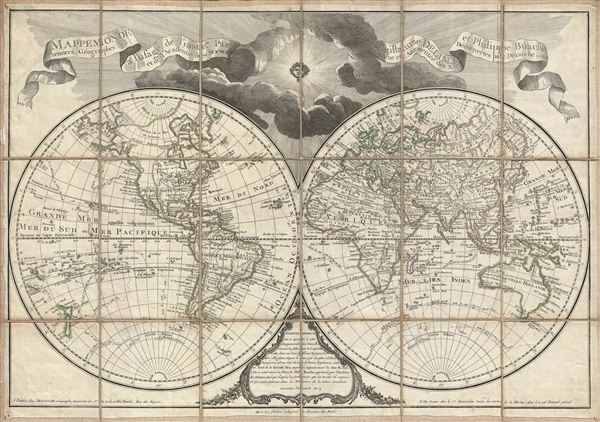 An uncommon and appealing 1808 pocket map of the world in two hemispheres by Dezauche. This is a later revision, by Dezauche, of Guillaume de Lisle and Phillipe Buache's map of 1785. This popular map, which underwent numerous revisions and republications, chronicles the final years of the age of exploration. The present example, though dated 1808, offers a post-Cook pre-Vancouver world view. The northwestern coasts of America, the southeastern coasts Australia, and interiors of Africa, Asia, South America, North America, and Australia remain largely unknown. The tracks of Captain Cook's three historic voyages, as well as the site if his untimely death in Hawaii, are carefully depicted. Van Diemen's Land, or Tasmania, remains attached to the mainland of Australia. In the American Northwest much is unknown and confused. Vancouver Island does not appear and many of the inlets explored by Cook are wildly oversized – leaving open the possibility that they lead to a Northwest Passage. In Africa Lake Malawi appears in embryonic form and is suggestive of further lakes in the Rift Valley – the discovery of which would not follow until half a century later. One of this map's most interesting and curious elements it its inclusion of 'Fousang des Chinois' in what is today British Columbia or Alaska. Fusang or Fousang is a region first documented by the Chinese Buddhist missionary Hui Shen in the 5th century. Hui Shen describes a land some 20,000 Chinese Li (c. 8000 km) east of the China coast. Fousang is described in considerable detail in the 7th century Book of Liang by Yao Silian. There are also accounts that the land was settled c. 220 BC by a Chinese emperor of the Han Dynasty. In later days Fusang was commonly used in Chinese poetry to designate Japan, however earlier references keep it distinct. In any case, Hui Shen's description of Fusang with regard to distance and geography corresponds more with the coastlands of North America than with Japan. The French historian Joseph de Guignes in his 1761 article 'Le Fou-Sang des Chinois est-il l'Amerique? ' promoted this idea. Cartographers of the era, including De L'Isle, embraced the idea and it was included in many subsequent maps of the region. Overlooking the map is a personified sun pushing back dark clouds. This common map graphic expresses the triumph of science and exploration over darkness of superstition and the unknown. Versions of this map were issued in several atlases of the period, but this particular example is an independent issue and thus quite uncommon. Phillipe Buache (1700 - 1773) was a late 18th century French cartographer and map publisher. Buache began his cartographic career as the workshop assistant and apprentice to the important and prolific cartographer Guillaume de L'Isle. Upon De L'Isle's untimely death, Buache took over the publishing firm cementing the relationship by marrying De L'Isle's daughter. Over the years, Bauche republished many of De L'Isle's maps and charts. Buache was eventually appointed Premier Geographe du Roi, a position created-for and previously held by Guillaume de L'Isle. Buache is most respected for his introduction of hachuring as a method from displaying underwater elevation on a two dimensional map surface. Buache compiled maps based upon geographic knowledge, scholarly research, the journals of contemporary explorers and missionaries, and direct astronomical observation. Nevertheless, even in 18th century Paris geographical knowledge was severely limited - especially regarding those unexplored portions of the world, including the poles, the Pacific northwest of America, and the interior of Africa and South America. In these areas the Buache, like his primary rival Robert de Vaugondy, must be considered a speculative geographer or 'positive geographer'. Speculative geography was a genre of mapmaking that evolved in Europe, particularly Paris, in the middle to late 18th century. Cartographers in this genre would fill in unknown areas on their maps with speculations based upon their vast knowledge of cartography, personal geographical theories, and often dubious primary source material gathered by explorers and navigators. This approach, which attempted to use the known to validate the unknown, naturally engendered many rivalries. Buache's feuds with other cartographers, most specifically Didier Robert De Vaugondy, resulted in numerous conflicting papers being presented before the Academie des Sciences, of which both were members. The era of speculatively cartography effectively ended with the late 18th century explorations of Captain Cook, Jean Francois de Galaup de La Perouse, and George Vancouver. Buache was succeeded by his nephew Jean-Nicholas Buache de Neuville. Jean-Claude Dezauche (fl. c. 1780 - 1838) was a French map publisher active in Paris during the first half of the 19th century. Dezauche's business model focused on editing and republishing the earlier maps of Phillipe Buache and Guillaume de L'Isle, which he acquired from Buache's heir, Jean Nicholas Buache, in 1780. Like Bauche and Dezauche held a position with the Depot de la Marine and his name many of their maps. Jean-Claude Dezuache eventually passed his business to his son, Jean André Dezauche. Very good. Dissected and mounted on linen. Original linen in excellent condition. Even overall toning.